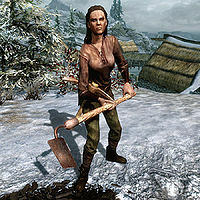 Beitild is a Nord miner who owns Iron-Breaker Mine in Dawnstar. She is married to Leigelf, owner of Quicksilver Mine, though their feud has caused them to live in separate houses. She will pay for any iron ore you dig up, and doing so will increase her disposition towards you. Beitild is also a target of a Dark Brotherhood contract. She gets up at 6am for a one-hour breakfast, then heads to work in Iron-Breaker Mine, pausing at noon and 7pm for a one-hour lunch. She ends her workday at midnight and goes home for sleep. She wears a set of miner's clothes and a pair of boots, and is equipped with a pickaxe. She carries a key to her house and a selection of common items and gold. She is very proud of her mine and she will make this clear by saying things like "I own Iron-Breaker Mine. We make twice as much coin as those horkers over in Quicksilver Mine, and don't let anyone tell you otherwise." and "Iron-Breaker Mine is three times the worth of that Quicksilver Mine and its fat-head owner." However, she is also very critical of her employees and she will show this by remarking "My miners are as dumb as rocks are grey." Should Leigelf die, she may remark about it when approached: "My husband Leigelf is dead. I... I never thought I would miss that oaf so much." Asking her who is in charge around the place will be replied, "That would be Jarl Skald the Elder. He's over in the White Hall, probably talking about Ulfric like he's the second coming of Talos." If the Imperials take control of the Pale, she will instead say, "Jarl Brina Merilis is in charge, thanks to the Empire. Best hide any Talos amulets you have." You may also ask her what she does in Dawnstar, and she will respond, "I own Iron-Breaker Mine. We make twice as much coin as those horkers over in Quicksilver Mine, and don't let anyone tell you otherwise. I pay a good wage for any iron ore you dig up, if you're looking for work." If Waking Nightmare has not been completed and Dawnstar is still plagued by nightmares, she may tell you, "You're wrong to come here, stranger. No rest in Dawnstar." When asked about what she means, she will explain, "Everyone here is having nightmares. I have miners tripping over their own feet from lack of sleep. I heard there was a Priest of Mara who was supposed to be looking into it. We'll see if anything comes of that." Once you've received your orders to kill Beitild, you may ask Nazir about her. He will say, "She separated from her husband several months ago. Now the two run competing mining operations. Beitild's angry and desperate. A fighter." Like with most targets of the Dark Brotherhood, you may also have a word with Beitild before killing her. She will not be welcoming: "I'm really not in the mood. State your business, or take your leave." and you can reply in three ways. If you walk away instead of answering her, approaching her again will have her tell you, "I'm busy, and you're bothering me. So go away." "I represent the Dark Brotherhood. Your death is at hand!" "Someone wants you dead, Beitild." After the deed is done and Beitild lies dead, approaching Leigelf may have him tell you, "My wife Beitild is dead. Can't say I miss that old sabre cat." This page was last modified on 4 April 2014, at 21:19.